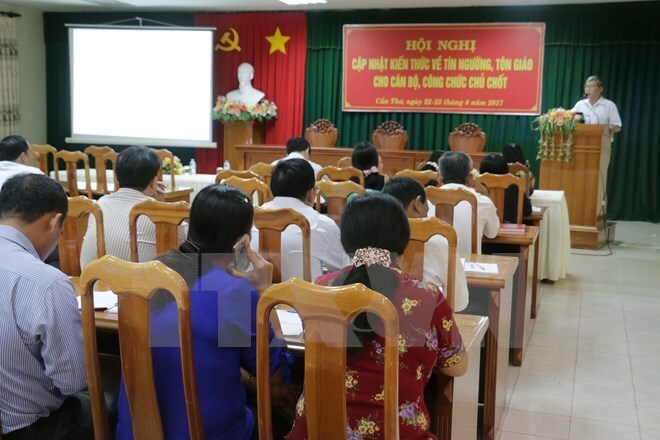 Hanoi (VNA) – The Government Committee for Religious Affairs (GCRA) and the Lao Front for National Construction (LFNC) will increase delegation exchanges and cooperation in training officials in charge of religious work while supporting the two countries’ Buddhist Sanghas in conducting their activities. The two sides reached the agreement during talks between Bui Thanh Ha, deputy head of the GCRA, and visiting LFNC Vice Chairman Chanthavong Sene Amatmontry in Hanoi on August 23. They exchanged views on religious situation and shared experience in State management on religion as well as reviewed the implementation of their cooperation agreement signed in Hanoi in July 2014. Both sides agreed that delegation exchanges and experience sharing in religious work have helped promote Buddhism cooperation between Vietnam and Laos. The fruitful collaboration between the agencies has contributed to strengthening the traditional friendship and comprehensive cooperation between the two countries and the relations between the two Buddhist Sanghas in particular. Briefing his guest about the current religious situation in Vietnam, Ha highlighted that religions, especially Buddhism, are developing rapidly in Vietnam. The National Assembly has passed the Law on Belief and Religion, creating favourable conditions for religious activities and meeting people’s demand for religious and belief practices. He added his committee is building a decree guiding the implementation of the law, which will take effect on January 1, 2018. For his part, the Lao guest said that the Lao Front for National Construction will organise a line-up of religious events in the coming time, including the Lao-Vietnam-Cambodia Buddhism conference, a conference on religious activities of six Greater Mekong Subregion (GMS) countries and a religious festival with the participation of ASEAN member states.